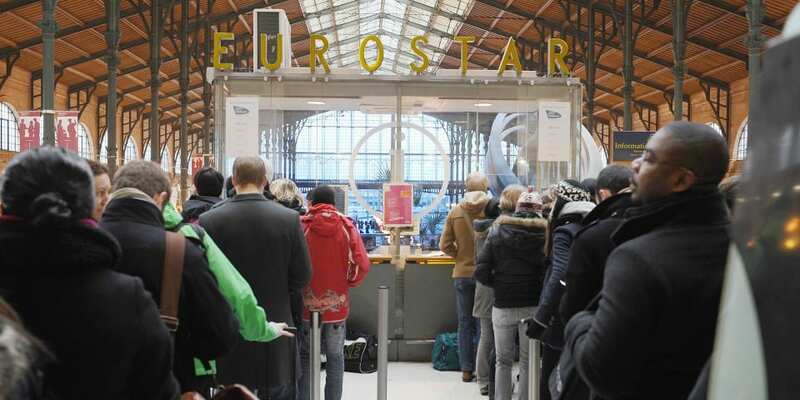 Eurostar has told passengers using its trains to Paris not to travel until at least 3 April due to ongoing industrial action by French customs at Gare du Nord station in Paris. There have been queues of up to six hours for passengers departing the French capital amid major delays and train cancellations, prompting some holidaymakers to wonder if this is a taste of travel to the EU this summer if there is a no-deal Brexit. French customs’ officers are asking for higher pay, better working conditions and more staff to cope when Britain leaves the European Union. Since earlier this month checks on passengers have become much more rigorous than previous methods, to highlight, according to French union leaders, the lack of preparedness for Brexit. What can you do if you’re affected? Eurostar is urging passengers not to travel unless absolutely necessary and warns that its priority check-in service is also suspended. A full list of disrupted trains can be found here. Instead, the train company is offering anyone travelling up to 3 April a full refund or a free change to travel at a later date. If you do decide to travel and your train is delayed or cancelled you may be entitled to compensation. With no advertising, we produce independent and unbiased reporting on the travel issues that matter, from dodgy holiday deals to insurers that don’t pay out. Find out more about Which? Travel. Anyone hoping to still travel from London to Paris this weekend by plane instead is going to have to dig deep. When we looked, last minute British Airways’ flights from London Heathrow to Charles de Gaulle travelling out on Friday evening and returning on Sunday evening were £772 per person and upwards. And Air France’s flights from Paris to London on Sunday were all full after lunchtime. Recent research by Which? Travel revealed that UK passengers flying to Spain could face queues of several hours in the event of a no-deal Brexit. Alicante airport in southern Spain would need the staff and resources to deal with an estimated additional 201 hours of immigration checks on British passport holders, on average, every single day. The European Tourism Association (Etoa) has estimated that additional checks could add an extra 90 seconds for each UK passport holder. To put that in context, it would take a single passport lane an extra 17,010 seconds – nearly five hours – to process the 189 passengers on a single Ryanair flight, if all those passengers were UK passport holders.